Recently we shipped three new features — Table Tiles, Limited Users & Rich Excel Exports. Table tiles are perfect for presenting dense numerical data in a single tile. Limited user lets you give access to your colleagues while hiding sensitive salary information. Rich Excel exports now retain full formatting and closely match the look and feel of our beautiful reports. The Jirav dashboard offers different types of visualizations but some data is best displayed in a table. Table tiles are specifically designed to harmonize well with the rest of the dashboard and display tabular data in a very clean way. Jirav makes collaboration effortless but sometimes it's necessary to restrict sensitive data like payroll information. Jirav now supports a new user role called Limited User which removes access to salaries and term date while still giving read-only access to the Dashboard and Reports. You can now confidently invite others to the platform and be sure that sensitive information is securely redacted. Read more about all the user roles and their permissions here. Jirav's reporting engine gives a beautiful and uniform look to all your financial and non-financial information that can be shared directly or as PDFs. 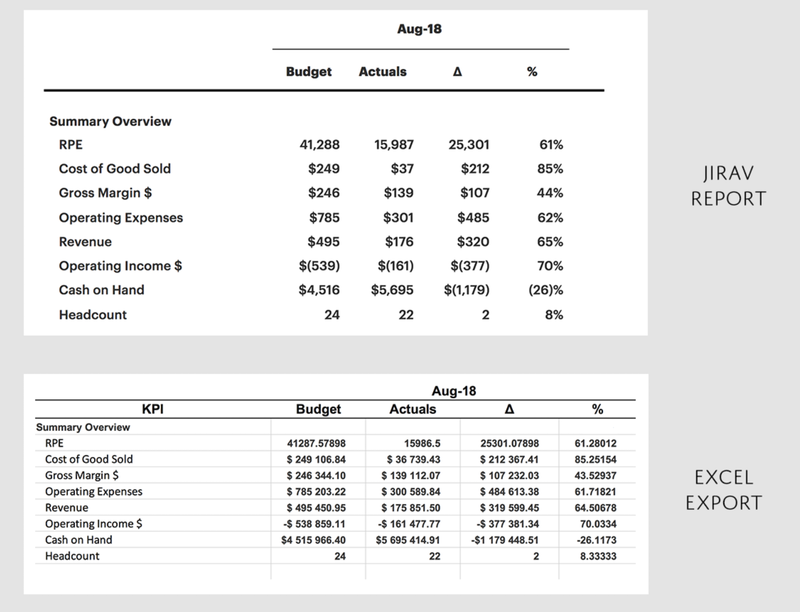 Now, even when you export your report into Excel, it still retains the rich formatting.